— 60 metre cycle lane to run in middle of four traffic lanes. Planned traffic management changes mainly focused on the north and south quays in Dublin also includes making the junction at Christ Church Cathedral more complex with sub-standard cycle lanes. 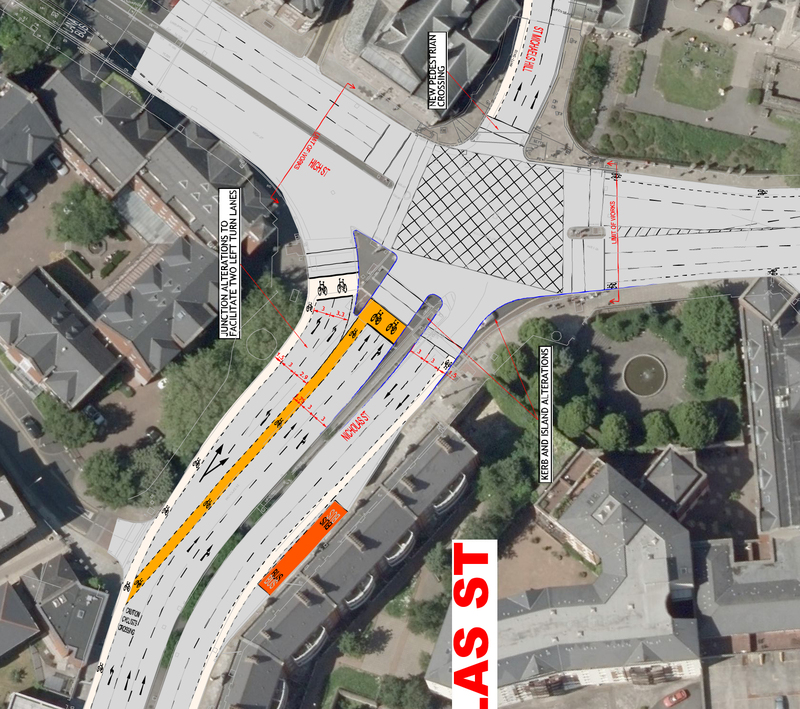 IMAGE: A drawing from the public consultation showing the full junction. The design goes against principals and key details in the National Cycle Manual and the Manual for Urban Roads and Streets, including the principal that left slip turns should be removed because these are unsafe for cyclists and pedestrians. Public consultation on the changes also includes the planned Eden Quay bus gate, new bus lanes, and new but small and disjointed sections of cycle lanes on the quays. Details can be found on DublinCity.ie and the consultation ends on Monday. The main changes are on the Nicholas Street approach to the junction. Instead of removing the slip turn as recommended in two national design manuals, Dublin City Council has chosen to retain the slip turn and add a second motoring lane to the turn while keeping the cycle lanes narrower than required under the National Cycle Manual. IMAGE: Sample design from the National Cycle Manual. The Cycle Manual calls putting cyclists between two traffic lanes “streaming”. 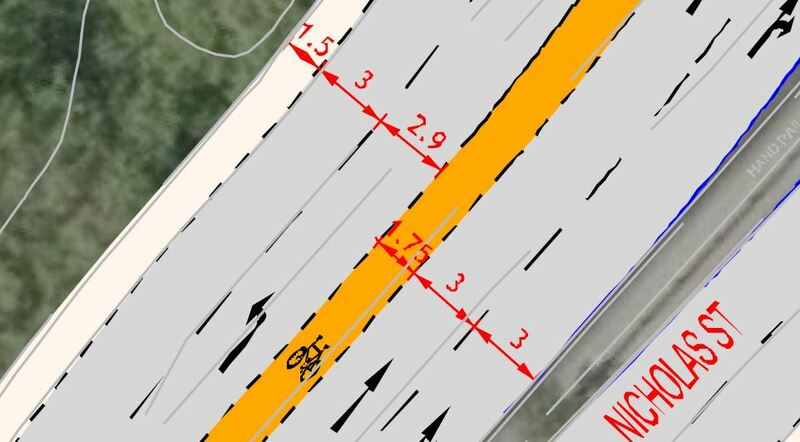 It states that the “streaming cycle lane should be 2.0m wide to take account of moving traffic on both sides of the cyclist”, but the council are planing for the streaming cycle lane to be only 1.75m wide. The kerb-side cycle lane, at 1.5m, will also be below the minimum for such a lane, 1.75m. The Cycle Manual states that “Streaming is not suitable along HGV routes”, while the planned wider left hand slip turn at the junction is a part “designated HGV route” within the HGV cordon area. The manual adds: “The permitted weaving area for traffic to cross the cycle lane must be clearly indicated and limited to no more than 10.0m long so as to reduce vehicular speed, and profiled line markings should be considered for the solid white line beyond the weaving area.” The current public plans for the junction, however, show no different coloured area and the permitted crossing area for motorists as defined by broken white lines as 50m long. IMAGE: A crop of the public consultation drawings showing all the traffic lane widths. Agree that this detail is poor, but it should not be highlighted as if it was the major element of the proposed scheme! The overall progressive proposals in the main scheme as part of the improvements in Dublin City centre for public transport and cycling are what need to be highlighted! @Colm re “highlighted as if it was the major element of the proposed scheme” — I’ve not done so, I’ve highlighted it as a design which goes against guidelines and policy and, more importantly, puts people at further risk of I injury or death. IrishCycle.com has already has covered the traffic management currently at consultantion in three or four different articles! Good god, this is disgraceful, dangerous and will actively dicourage people from cycling. Look at the photos of Fairview ive posted on Twitter. This is just the same. The ‘cycle lane’ will be completely crowded out by cars. This is awful. It is a really poor junction at the moment. Quite difficult as a cyclist if you are going straight. A lot of the time you end up in a driver’s blindspot as the move to the left turning lane.